PT Pelabuhan Indonesia II (Persero) - Pelindo 2 or most commonly known as Indonesia Port Corporation II (or referred to as "IPC Group") is a leading and well-know state-owned port and logistics company in Indonesia. Together with its 15 directly owned subsidiary and affiliated companies, IPC Group offers services in the field of ship services, cargo services, and other related services. PT Pelabuhan Indonesia II (Persero) is a non listed state-owned company and is fully-owned by the Government of Indonesia. With main branch in Tanjung Priok port Jakarta, IPC Group now has 10 operational areas and 12 port branches spread in the western part of Indonesia, comprise of Port of Teluk Bayur West Sumatera, Port of Pulau Baai Bengkulu, Port of Jambi, Port of Palembang South Sumater, Port of Pangkal Balam Bangka Belitung, Port of Panjang Lampung, Port of Tanjung Pandan Bangka Belitung, Port of Tanjung Priok DKI Jakarta, Port of Sunda Kelapa DKI Jakarta, Port of Banten, Port of Cirebon West Java, Port of Pontianak West Kalimantan. IPC Group’s performance in 2016 improved over the previous year. 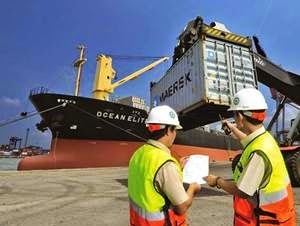 According to PT Pelabuhan Indonesia II (Persero) Annual Report 2016 as cited by JobsCDC.com, IPC Group managed to record total operating revenue of Rp8.93 trillion in 2016 or up 15.87% from Rp7.70 trillion in the previous yea. Total income for the year in 2016 was recorded at Rp1.54 trillion or up 13.44% from Rp1.36 trillion 2015. Total assets in 2016 was recorded at Rp43.47 trillion, increased by 2.07% from Rp42.59 trillion in 2015. Physically healthy, free of narcotics and not color blind proven by letter from authorized institution. Not undergoing official ties to government agencies or other companies. Willing to undergo contractual ties for 12 months. JobsCDC.com now available on android device. Download now on Google Play here. Please be aware of recruitment fraud. The entire stage of this selection process is free of charge. 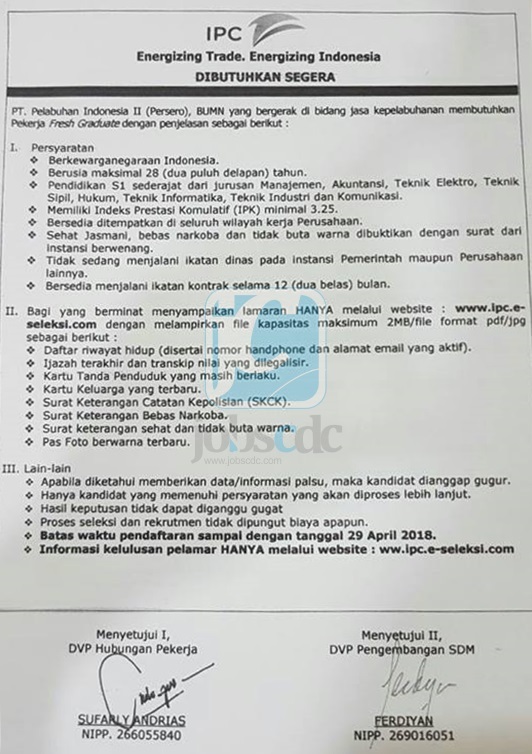 PT Pelabuhan Indonesia II (Persero) - Fresh Graduate Program IPC Group March 2018 will never ask for fees or upfront payments for any purposes during the recruitment process such as transportation and accommodation.